This is what the Zhen Hua 25 will look like when it passes underneath the Delaware Memorial Bridge. These are some big cranes! The Delaware Memorial Bridge is closing twice in an eight-day span to accommodate a “heavy lift vessel” transporting 188-foot cranes to Philadelphia. Both northbound and southbound traffic will be closed to all traffic for a half-hour Tuesday night, in the first of two trips by the Zhen Hua 25, the ship transporting the cranes to the Packer Avenue Marine Terminal at the Port of Philadelphia. The Delaware River and Bay Authority said in a release that the bridge will be closed around roughly 11:45 p.m. Tuesday night, and will reopen around 12:15 a.m. Wednesday morning. The vessel needs to travel under the bridge during low tide, the DRBA explained, and the bridge is closing to eliminate potential distracted driving. 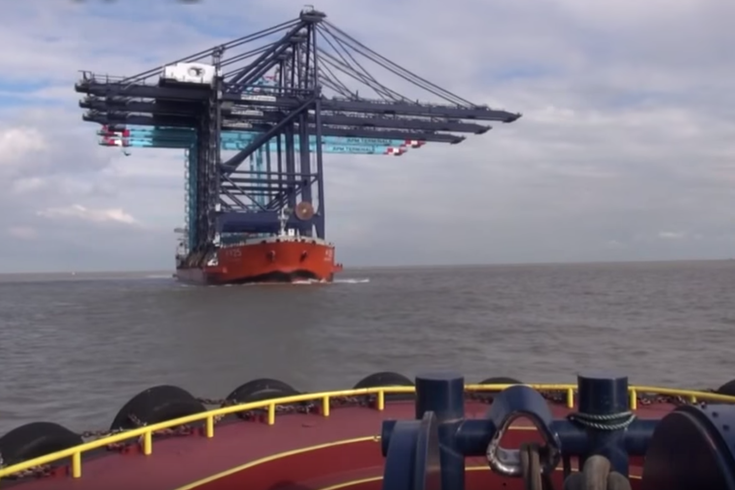 The vessel is carrying what are called Super-Post-Panamax cranes, container cranes designed for high-volume loading and unloading. The Port of Philadelphia purchased these cranes from Shanghai Zhenhua Heavy Industries Company Limited back in December of 2017. The bridge will be closed for a second time when the Zhen Hua 25 makes its return trip out of the Port of Philadelphia, which is scheduled for April 2. The DRBA expects the bridge will close to traffic around 5:15 a.m. on the morning of the second trip, and re-open around 5:45 a.m.